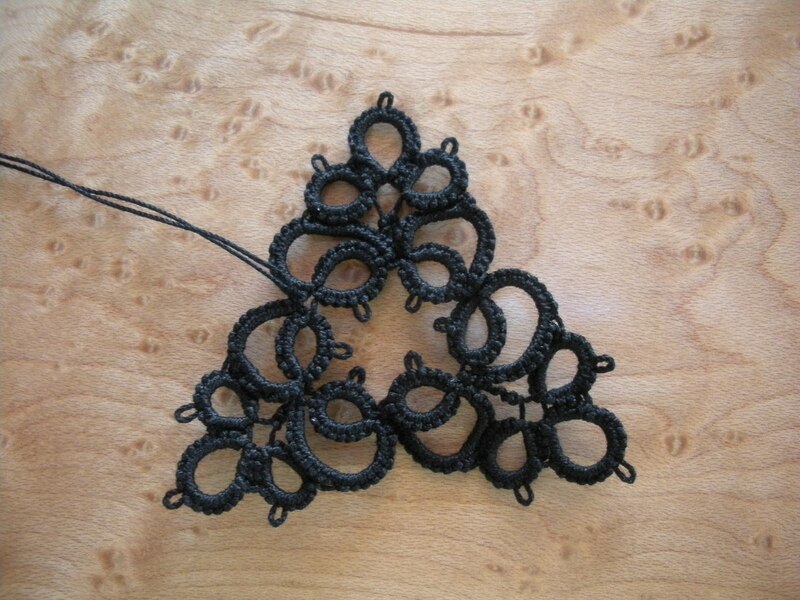 Well, the tatting is sorta, kinda done. Here are the motifs for the cleric's stole. 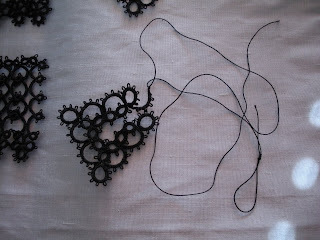 I've finished the majority of tatting for the project...except as usual, the ends need to be sewn in. UGH! The cross patterns is Rebecca's Colossians 2?14 cross pattern. Also, I've got to find one of the square motifs....One must wonder how you simply lose something that takes hours to tat....I think I know where it is. 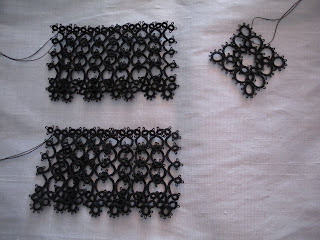 And finally, the edging is one pass too short and therefore, I must join and tat another pass on each edging. Ergo, I don't think I'm quite ready to say, "all done". On another note, Here are a few pics of the Sago palm that grows in our 'front yard'. I live on a corner street in the center of the city. We planted this Sago about 9 years ago with the hope it would last through one North Carolina winter. 9 years and 12 off shoots later, we trim it back every spring and this is the result. It's such a prehistoric looking plant as it begins to emerge. I hope your days a grand! Here is the triangle motif. But, goodness...it wasn't easy. I now realize the two joins to the longer thread give it a bit of substance. Zoom in and you'll see the difference between the top one and the bottom two. I 'got it' after the first one. The second two seem to be correct. 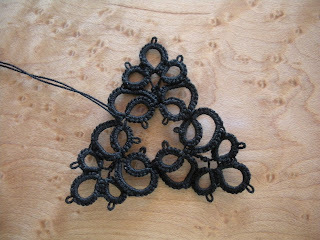 Tatting several of the projects in the Blomqvist and Persson book I have to flip the piece and join...then, flip back. I also had to do the shoe string trick on each repeat. Additionally, the pattern does not + after the chains...but I did. Not sure this was correct but I'm really happy with the final outcome. Hoping your day is wonderful!! As you can see, white rough silk was the fabric and there were a few tatted motifs in 'windows'. 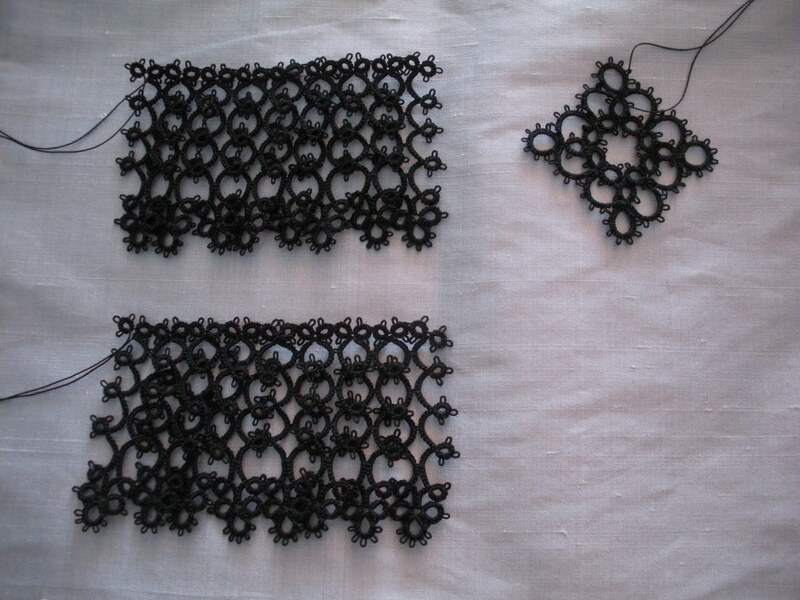 For the current stole (stole #2), I've tatted most of the motifs and the edging...but, now I'm stuck. I want to tat a triangle I found in Blomqvist and Persson found on page 49. However, the pattern doesn't make sense to me. The scanner is not working to scan a pic of the pic...but if any of you have this book, Please, Please look at the pattern and let me know what they mean when it comes to (join to loop of thread twice, + in picot)....I don't get it. I hope to cut and sew the stole today and then start attaching the motifs either tomorrow or during next week. Help me out here... I can always put a different motif into the 'window'...just kinda wanted a triangle. I'm working on another Cleric's Stole. This one is going to be in Icy Blue rough silk. I've given the recipient the choice of colors. She chose the lighter blue silk with black tatted motifs and edging. So, here's the combination to this point. I'm done with the edging and one of the motifs. I will tat a couple crosses and a couple triangles to represent the idea of the Christian Trinity. Of course, as usual, I have to hide the ends. Now, here's the frustrating piece...as if I would work on a project and not find a challenge. I figured the amount of thread to load on the two shuttles for the second square motif.....problem was, I forgot to include the idea of a little extra to stay on the bobbin....AAaaarrrrggghhhh!! ! The little bit of thread you see would probably been enough to complete the motif.... just not enough to anchor as I tatted. The squares tat up quick enough to just start over. I'll keep ya'll posted on the project. On another note, I'm missing my mom today. She's in Florida and I'm in North Carolina. I wasn't able to get there this year and she couldn't come this way. I'd rather share this day with her. But we both know we care for and love each other. To all the mothers, a Giant Happy Mother's Day!